Deciding on your dorm Christmas tree is the hardest part of dorm room decorating for the holiday season. There are so many styles that it can be overwhelming. Picking out your dorm Christmas tree is like picking out your Twin XL Dorm Bedding. It is where your dorm room decor begins and you want to make sure it helps you create a one of a kind look. Now that you're living on your own in a college dorm room or college apartment, you may not want a traditional green Christmas tree like your mom and dad have. Maybe you want something just a little bit different but not too much. 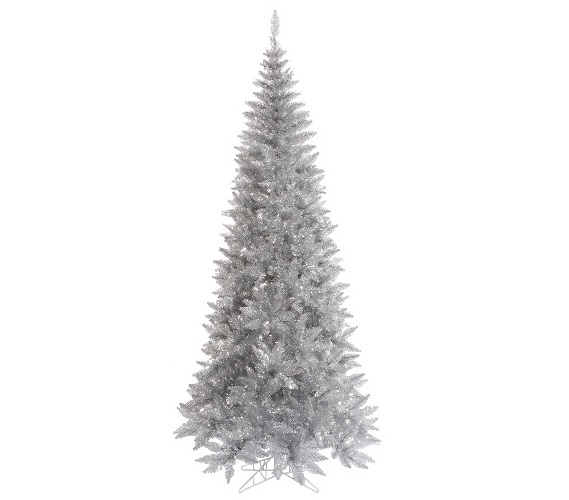 For a cool look to your holiday dorm room decor, add our Tinsel Silver Slim Fir Tree. This dorm essentials item has a slim, compact design that is perfect when you don't have a lot of space to spare. The branches are a cool silver color that will still add traditional Christmas colors to your dorm room decorations for the holidays without being as traditional as your parents' green Christmas tree. Simply set up this dorm necessities item in a corner of your college dorm room, add your garland and mini dorm lights, and your college Christmas tree will be complete and sure to impress your friends!